Southern Bancorp CEO, Darrin Williams, and Southern Bancorp Community Partners COO, Karama Neal, joined CDFI leaders from across the Southeast on Monday to discuss opportunities and strategies for financial institutions working to serve economically distressed and financially underserved communities. The event, CDFI Banks in the Southeast: Embracing Opportunities and Addressing Challenges, was hosted by the Federal Reserve Bank of Atlanta and the Federal Home Loan Bank of Atlanta and featured speakers such as Annie Donovan, Director of the U.S. Treasury Department’s CDFI Fund; Michael Johnson, Executive Vice President of Bank Supervision and Regulation for the Federal Reserve Bank of Atlanta; and Sylvia Plunkett, Senior Deputy Director of the Federal Deposit Insurance Corporation. 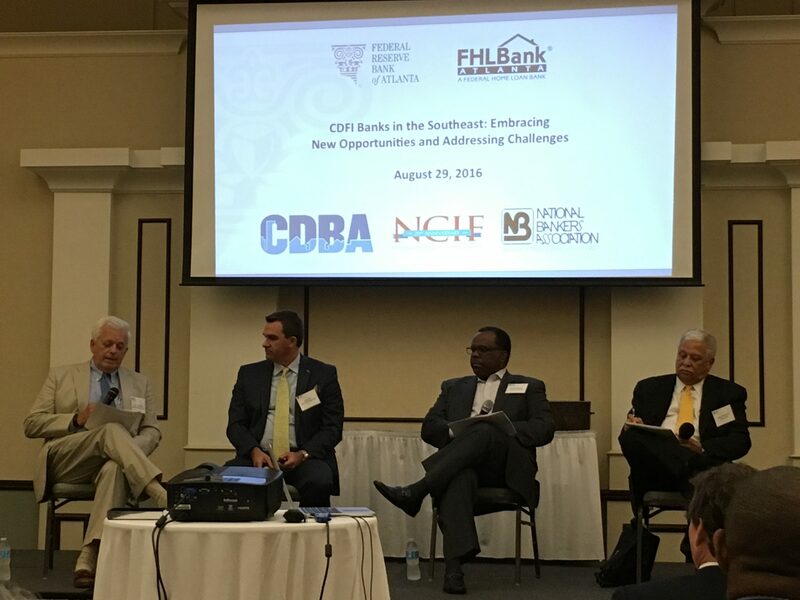 As part of a panel discussing CDFI business strategies for the future, Williams discussed Southern Bancorp’s own approach to building a cohesive brand both outside and within Southern’s walls that effectively serves its customer and client base now, while also laying the groundwork for serving their future needs. Karama Neal spoke about how Southern uniquely fulfills its mission to create economic opportunity in underserved and economically distressed communities by combining the efforts of a CDFI Bank and a CDFI Loan Fund. All three of Southern Bancorp’s entities, Southern Bancorp, Inc.; Southern Bancorp Bank; and Southern Bancorp Community Partners are certified by the U.S. Treasury as Community Development Financial Institutions (CDFIs). On the web at www.banksouthern.com.